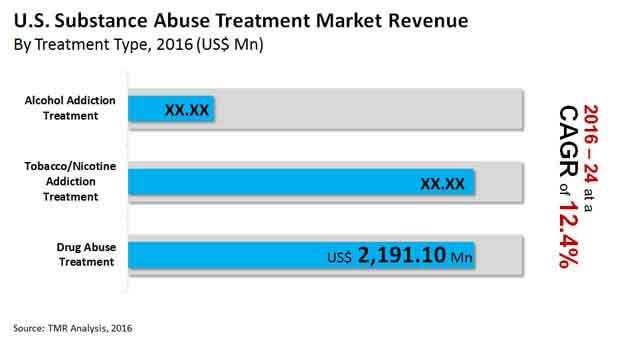 The U.S substance abuse treatment market is highly fragmented with around 242 companies operating in it. Competition is stiff among the players. Some of the prominent participants in the market are Alkermes Plc, Pfizer Inc., GlaxoSmithKline Plc., and Purdue Pharma LP. To further their market shares, these leading companies are coming up with different effective marketing strategies to enhance their visibility. This will likely increase the competition in the market in the near future. According to a report by Transparency Market Research, the market for substance abuse treatment in the U.S. will expand at a robust 12.40% CAGR to reach a value of US$12.43 bn by the end of 2024 from US$4.42 bn in 2015. The prominent end users in the U.S. market for substance abuse are outpatient treatment centers, residential treatment centers, and inpatient treatment centers. Among them, the outpatient treatment centers account for maximum share in the market and going forward too will retain their position due to the increasing popularity of outpatient rehab across the country. Depending upon the type of treatment, the U.S. market for substance abuse has been segmented into tobacco or nicotine addiction treatment, alcohol addiction treatment, and drug abuse treatment. Of the three, the demand for drug abuse treatment has outshined the other two. The segment is slated to see robust demand in the years to come as well. Some of the popular drug abuse treatment in the U.S. are buprenorphine, methadone, and naltrexone. Buprenorphine, of them, is forecasted to clock solid growth in the foreseeable future on account of continued development in buprenorphine pills and film and the recent unveiling of buprenorphine implants. At the forefront of driving growth in the U.S. market for substance abuse is an ever increasing number of people addicted to nicotine or tobacco, alcohol, and opioid. This has exerted an immense pressure on the nation’s government and burdened its economy as well. “The U.S. government has come up with several early intervention and presentation strategies to manage this situation, which is likely to boost the uptake of substance abuse treatment in this country over the next few years,” informs the lead analyst of the TMR report. Besides, the U.S. market for drug abuse is also expected to benefit from the growing initiatives by the leading providers of substance abuse, who are experimenting with different measures, to generate awareness among addicts and drug vendors about the disastrous consequences of drug abuse and the importance of tackling it via treatment. They are liberally using mediums such as television, newspapers, and information brochures to reach out to the needy and it has proved to be highly effective in dealing with the substance abuse problem. The trend will likely continue in the years to come as well and will have a positive impact on the market. “Hobbling the growth in the U.S. market for substance abuse, on the other hand, is the dearth of options for the treatment of mental illness caused by substance addiction and various legal obligations obstructing the clearance of therapies from the FDA may hinder the growth of this market to some extent in the near future,” notes the analyst of the report.